Injury Pile-Up Means Another Make-Shift Side At Stoke – Might Potter Switch To a Back Three? 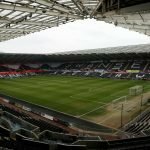 Swansea City suffered a few more injury setbacks after Saturday’s tough 0-0 home draw against Nottingham Forest as both Bersant Celina and Jay Fulton will definitely sit out Tuesday night’s trip to Stoke City. With Leroy Fer and Tom Carroll also unavailable through injury, manager Graham Potter’s tactical versatility will be tested again as he has to try and put a squad together with just one senior central midfielder available in Matt Grimes available. Yan Dhanda and George Byers are on standby and hoping to feature. Kyle Naughton is likely to start in midfield having played there when he came on against both Nottingham Forest and Millwall but with a lack of other options there, could Potter switch to a back three and give Spurs loanee Carter-Vickers his first start of the season? With McKay, Asoro and Dhanda failing to perform on the wing last weekend, it wouldn’t be surprising to see Potter switch things up. 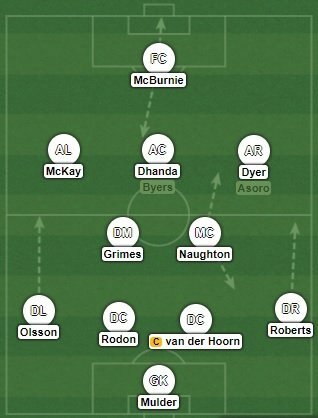 Connor Roberts and Martin Olsson do offer better balance as wing-backs and the Swans boss might be a bit more ambitious by fielding a front 3 rather than sticking McBurnie up top on his own. It’s all guesswork of course, but a back four and a midfield duo sitting in front does appear to be a challenge, unless Potter has enough confidence in Naughton to do a job there alongside Grimes. A back four might look like this. If Potter doesn’t start with Carter-Vickers in a back three, I’d expect that it’ll be a consideration for the second half as we really do lack options to change an existing 4-2-3-1. Let us know what your team would be for Tuesday night at Stoke City in the comments below.